Soul in Wonder sees Miten going back to his roots - combining the rock and blues of his youth with dance rhythms, chants, and mantras. It is, most of all, an album of stories - of wood smoke, banyan trees, and holy rivers in the moonlight - Of an artist reaching a level of acceptance - A true soul in wonder. Over its ten tracks Soul in Wonder takes the listener on a journey. From the opening Eyes of An Angel, through the beautiful landscapes of Lokah Samasta and Calma e Tranquilidade, to delightful covers of songs by Peter Makena, Van Morrison and Mississippi Fred McDowell, and on to Miten's own heartfelt compositions, Awakening, Humaniversal and Free Spirit. The CD features the divine vocals of Deva Premal, as well Nepalese bansuri maestro Manose; Ravi on the electric Kora; Spencer Cozens from Joan Armatrading's band on piano; Arran Ahmun on drums; Martin Brunsden on bass; Grammy award winning blues artist Harry Manx on hillharp; Kit Walker on Hammond B3; Rainier Scheurenbrand on nylon string guitar and mandolin; and London Commuinity Gospel Choir star, Wendi Rose. 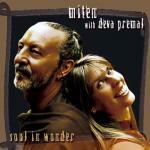 With Soul in Wonder the duo of Miten and Deva Premal portray two talented artists finding a new unity of purpose and acceptance, and inviting those who listen to share in that awakening.